100,000 Homes – the Campaign is a national movement of over 175 communities working together to find permanent homes for 100,000 chronic and medically vulnerable homeless Americans by July 2014. 100,000 Homes communities have already moved more than 20,000 homeless Americans into permanent housing, transforming their public systems along the way. Powered by Community Solutions and supported by a broad base of national and local partners, the Campaign helps communities turn their services systems capable of ending street homelessness for good. As a movement, we are not interested in managing homelessness indefinitely. We are interested in ending it. Participating communities do three things differently: First they identify every homeless person on their streets by name. Second they track and measure their local housing rates against clear monthly goals. Third, they improve local systems to make housing simpler, faster and more efficiently targeted. Building Dignity, Washington State Coalition Against Domestic Violence – explores design strategies for domestic violence emergency housing. Thoughtful design dignifies survivors by meeting their needs for self-determination, security, and connection. The ideas here reflect a commitment to creating welcoming, accessible environments that help to empower survivors and their children Building Dignity is the essence of advocacy, Seattle and Olympia, WA. District Alliance for Safe Housing – an innovator in providing access to safe housing and services to survivors of domestic and sexual violence and their families as they rebuild their lives on their own terms. No matter what the situation, we meet survivors where they are and strive to eliminate all barriers that prevent them from accessing safe housing. We work to ensure that all survivors have the tools and skills they need to be exactly who they choose to be and to create and maintain safe homes. We support partner agencies in the national capital region and throughout the United States in increasing their capacity to assist survivors in accessing safe housing. DASH educates policy makers and service providers nationwide on the principles and best practices of successfully assisting survivors of domestic violence in recognizing that they are empowered and whole, Washington, DC. Domestic Violence Housing First, Washington State Coalition Against Domestic Violence – eliminates housing as a reason for survivors to stay in an abusive relationship by providing advocacy and a flexible approach to support that gives survivors the ability to establish a home and the freedom to choose how best to rebuild their lives. Key components of Domestic Violence Housing First include: tailored services, mobile advocacy, housing search support, landlord education, and temporary financial assistance, Seattle and Olympia, WA. Homes for the Homeless / Institute for Children and Poverty – provides technical assistance and publishes research reports, full-length books, and the bi-annual Journal of Children & Poverty. Housing Assistance Council, Inc. – a national non-profit organization that assists in the development of single- and multi-family housing and promotes homeownership for low-income rural families by providing research and information, technical assistance, training and low interest loans to non-profit and private organizations throughout the rural U.S.
Housing Finance Policy Center – established, by the Urban Institute, to provide timely, impartial data and analysis, and to educate policymakers and the public on how the housing finance system affects households, communities and the broader economy. The goal of the Center is to produce analyses and ideas that foster sound public policy, efficient markets and economic opportunity, Washington, DC. Institute for Children, Poverty & Homelessness – an independent nonprofit research and development organization. Founded in 1990, ICPH focuses on action-oriented research designed not just to study the complex issue of family homelessness, but also to provide data and ideas that will inform and enhance public policy on service homeless families. In addition to bringing information to policy makers at all levels of government and to colleagues in the research and advocacy community, ICPH also works to raise public awareness of homelessness through publications and other materials for schools and communities. ICPH researchers the causes of family homelessness, the demographics of this growing population, the conditions that make it difficult for homeless families to become self-sufficient, and the programs that are most effective in helping them transition our of poverty. ICPH works with programs and partner organizations across the U.S. to conduct and disseminate this research in order to improve services and influence public policy, New York, NY. National Survey of Programs and Services for Homeless Families ~ The Red, White, and Blue Book – a resource for service providers, advocates, researchers, and public policy makers working in the field of family homelessness. This guide provides a state-by-state snapshot of the interconnections between governmental and nonprofit work to end family homelessness. National Alliance to End Homelessness – a nonprofit organization whose mission is to mobilize the nonprofit, public and private sectors of society in an alliance to end homelessness, Washington, DC. National Association for the Education of Homeless Children and Youth – a national membership association dedicated to educational excellence for children and youth experiencing homelessness. Through state and federal policy and technical assistance to our members, students, and the public, we change systems so all children and youth can learn, succeed academically, and achieve their dreams. We provide professional development, resources, and training support for anyone and everyone interested in supporting the academic success of children and youth challenged by homelessness. We also engage in federal policy advocacy to strengthen policies and resources for homeless children, youth, and families. We are a grassroots membership organization that continually strives to meet the dynamic needs of our members. Our membership includes local homeless education liaisons, educators, school counselors, social workers, registrars, nurses, child advocates, shelter staff, state and federal policy specialists, and partners from community-based and national non-profit organizations, Minneapolis, MN. National Center for Homeless Education at SERVE – provides research, resources, and information enabling communities to address the educational needs of children and youth experiencing homelessness, Greensboro, NC. The National Center on Family Homelessness – a non-profit organization dedicated to developing long-term solutions to family homelessness. Its mission is to translate research findings and field experience into state-of-the-art programs and policies benefiting homeless and other low-income families, Needham, MA. The National Center on Homelessness Among Veterans – the mission is to promote recovery-oriented care for Veterans who are homeless or at risk for homelessness. The Center is a national resource that informs practices designed to meet the U.S. Department of Veterans Affairs' Five Year Plan to End Homelessness among Veterans, Washington, DC. 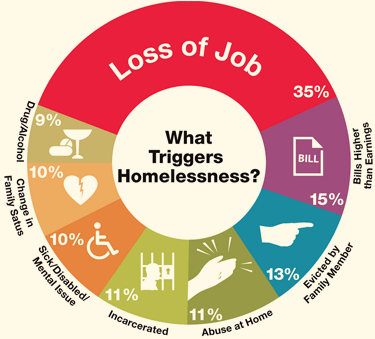 National Coalition for the Homeless – provides public education, policy advocacy and technical assistance around four topic areas: housing justice, economic justice, health care justice and civil justice. National Fair Housing Alliance – is the voice of fair housing. NFHA works to eliminate housing discrimination and to ensure equal housing opportunity for all people through leadership, education and outreach, membership services, public policy initiatives, advocacy and enforcement, Washington, DC. National Housing Law Project – a nonprofit national and legal advocacy center established in 1968. Our mission is to advance housing justice for poor people by: increasing and preserving the supply of decent, affordable housing; improving existing housing conditions, including physical conditions and management practices; expanding and enforcing low-income tenants' and homeowners' rights; and increasing housing opportunities for racial and ethnic minorities, Oakland, CA. National Housing Preservation Database – created by the Public and Affordable Housing Research Corporation and the National Low Income Housing Coalition in an effort to provide communities with the information they need to effectively preserve their stock of public and affordable housing. The NHPD incorporates all available data on federally subsidized housing properties and includes nine separate funding streams. The NHPD can be filtered by location, funding stream, or 'at risk of loss' status. National Housing Trust Fund Campaign – the Campaign is working to establish a National Housing Trust Fund that would build and preserve 1.5 million units of rental housing for the lowest income families over the next 10 years, Washington, DC. National Law Center on Homelessness and Poverty – the mission is to prevent and end homelessness by serving as the legal arm of the nationwide movement to end homelessness, Washington, DC. Read Blog. National Low Income Housing Coalition – dedicated solely to achieving socially just public policy that assures people with the lowest incomes in the United States have affordable and decent homes. Our goals are to preserve existing federally assisted homes and housing resources, expand the supply of low income housing, and establish housing stability as the primary purpose of federal low income housing policy, Washington, DC. See Out of Reach interactive map, reports and other resources. National Policy and Advocacy Council on Homelessness – dedicated to ending homelessness through grassroots advocacy and inclusive partnerships, Washington, DC. National Rural Housing Coalition – works to focus policy makers on the needs of rural areas by direct advocacy and by coordinating a network of rural housing advocates around the nation. Safe Housing Partnerships – the National Resource Center on Domestic Violence and the National Alliance for Safe Housing partnered to develop the website. They, along with the National Network to End Domestic Violence and Collaborative Solutions, Inc., are part of the Domestic Violence and Housing Technical Assistance Consortium, an innovative, collaborative approach to providing training, technical assistance, and resource development at the critical intersection of domestic violence, homelessness, and housing. Funded and supported by an unprecedented partnership between the U.S. Department of Health and Human Services, Department of Justice, and Department of Housing and Urban Development, this multi-year Consortium brings together national, state, and local organizations with deep expertise on housing and domestic violence in order to collaboratively build and strengthen technical assistance to both housing/homelessness providers and domestic violence service providers. The Consortium aims to improve policies, identify promising practices, and strengthen collaborations necessary to improve housing options for survivors of domestic and sexual violence and their children in order to enhance safety, stability, and well-being. Soldier On – we have been assisting homeless veterans since 1994. Now, however, we are moving beyond simply offering a response to veteran homelessness to providing a permanent solution. With out Veterans Village projects, we will offer formerly homeless veterans a chance to own their homes – more often that not for the first time in their lives. Our work still begins with getting homeless veterans off the street, Leeds, MA. Weingart Center Association – delivers high quality human services and provides leadership and innovative solutions to help break the cycle of homelessness and end poverty, Los Angeles, CA. Women's Institute for Housing and Economic Development – strives to develop, sustain and replicate successful projects that creatively incorporate family supports and have evident impact on the lives of low-income women and their families. They publish several resources, including "More Than Shelter: A Manual on Transitional Housing" and "Lifting the Voices of Homeless Women", a report by Roofless Women's Action Research that contains the issues raised and policy recommendations of homeless women.